Steve Reich’s masterpiece Tehillim (Psalms), with a light programme by Carel Kuitenbrouwer. Muziekgebouw aan ‘t IJ Amsterdam 31 March 2011, in the framework of World Minimal Music Festival. For this performance I designed and programmed a visual program using the LED’s integrated in the walls of the auditorium. These acoustic walls have a light-installation built in, consisting of two hundred panels or cells, that can be directed to take on any colour and intensity at any moment in time. Using Flash animation video and lighting software Ecue, a synchronous light programme was cued to the music by an operator during the live performance of the piece. The audience reacted very well to this enhanced performance of the very powerful minimal composition Tehillim. The video was compiled of several clips from three positions. It was made in Adobe After effects. 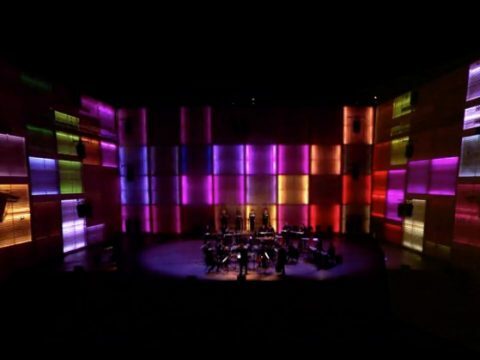 ‘Tehillim Illuminated’ was conceived and designed by Carel Kuitenbrouwer and performed on 31 March 2011 in the main concert hall at the Muziekgebouw aan ’t IJ, Amsterdam, as part of the World Minimal Music Festival 2011. Special thanks to Willem Hering. Tehillim Illuminated was made possible in part by the Amsterdam Fund for the Arts. The video recording was made possible in part by the internet radio service Radio 4 Eigentijds and the VPRO broadcasting company. The sole purpose of making and distributing this video is to document and promote the work of Carel Kuitenbrouwer. The video is not intended for commercial purposes and may not under any circumstances be copied, distributed, or sold, except with the express written permission of the creator, Carel Kuitenbrouwer.